Here's a great way to stay informed regarding the technical, business and marketing developments in the Modbus world. 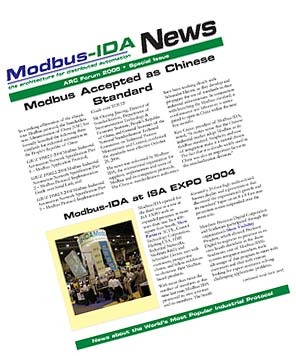 The Modbus Newsletter features news updates on worldwide Modbus standardization activities, new product information, technical notes, excerpts from the Modbus Developer Forum and other news and information of vital information to users and suppliers of Modbus devices. Better still, the Modbus Newsletter is free, and delivered right to your email account. It's delivered in PDF format, too, making it easy to view, print and share. If you'd like to sign up for a free subscription, enter your information in the form below. You can also check out past issues in the archive below. Older issues are available in the Newsletter Archive.